Richard Earp at Fraser Yachts in Monaco tells me of a €200,000 price drop on the 28.5m motoryacht Martello, a joint listing with his colleague Thorsten Giesbert in Palma. Built by Astondoa in 2004 to Lloyds class, Martello offers accommodation for eight guests in a master suite, VIP stateroom and two twin cabins, all en-suite. 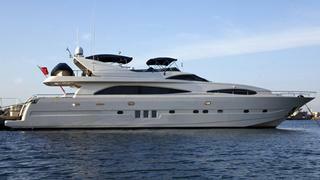 An expansive upper deck features a helm station, dining for eight, a Jacuzzi and two large biminis. Twin 1500hp MTU engines give Martello a cruising speed of 18 knots, a range of 330 nautical miles and her price is now down to €2.8 million.